I loved to watch animation series as a kid. Do you remember Voltez V and Mazinger Z? How about Heidi? These were some of the classic animation series that were popular in the 70s. Voltez V made a come back in 1999, the same year I gave birth to my youngest. I was happy reliving my younger years while watching the same old series. Would you believe I was singing the Japanese theme song of Voltez V to my kids? Catchy theme song is what I love About Anime. Younger people no longer called it animation, but anime (shortened version) or manga (Japanese comics). Whatever term they name it, I still love to watch animation until now, this time with my kids. We have a collection of anime movies by popular Japanese filmmaker Hayao Miyazaki. These are Spirited Away, Princess Mononoke, and Castle in the Sky, Kiki’s Delivery Service and My Neighbor Totoro. These movies are not only entertaining to watch, they also leave valuable lessons for audience to ponder — like love for the family and environment. 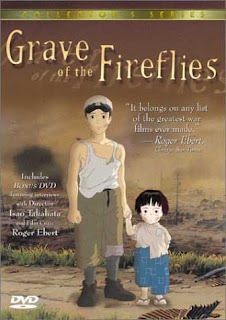 One anime film that truly made me cry was Grave of the Fireflies. This is the tale of relationship between two orphaned children that took place toward the end of World War II in Japan. I simply love this film. Unfortunately, my copy of the movie was missing. Good thing I can watch anime online and can download it anytime I want. I’m also a fan of game shows. Recently, I’ve discovered Wipeout TV Show on line. It is said to be the world’s largest extreme obstacle course. I had fun watching it on the Internet. I heard the American game show will have its premier in our local channel (GMA Ch7) here on March 15. I can’t wait to watch it with our local actors as hosts. This entry was posted in Uncategorized and tagged animation series, anime movies, Grave of the Fireflies, Hayao Miyazaki, Voltez V, wipeout tv show on March 10, 2010 by Yami.